On Tuesday I started having contractions throughout the day but they were irregular and they didn’t really hurt so I just continued in with my day. I went out to dinner with my friends Melissa and Tiffany. During dinner my contractions started coming more regularly but they still weren’t painful. When I got home at 10:00 they were coming about every 5 mins but they still weren’t painful. I told Ricky that this might be it but I didn’t want to get too excited. Ricky and I went to bed and I slept between contractions and they continued to get more intense. At 2:30 am I got up to go the bathroom and I noticed some bloody show. I realized at this point that it was probably the real thing. I woke up Ricky and had him start helping me time contractions. They were about 45 seconds long and 3-4 mins apart. At around 5:00 am I had Ricky call Sherry the student midwife that was apprenticing with April to give her a heads up. He also called to have the birth tub set up. I decided to lie down and rest. I slept between contractions and around 9:00 am I got up and noticed that the contractions had really slowed down they were only coming about 8 to 9 minutes. I called Sherry to see if I should try to get things going or just relax. She had my midwife April call me back. April said I probably needed to rest and had me take two benadryl and lie down and rest. I went to lie down. While I was asleep they came to set up the birth tub. I got up around 12:00pm and had lunch and just tried not to focus on the contractions. They were still coming but they were not as intense and they weren’t close together. Around 2:00pm I went back to lie down. I got back up around 4:00pm and noticed that my entire house was flooded. Ricky had left the hose in the tub and almost all of the water had drained onto my floor. There was about 2 inches of water in my kitchen and living room. I started freaking out. We were going to call in a flood company to handle it but then I realized I couldn’t have a bunch of strange men in my house while I was in labor. I called my friend Tiffany who I knew had a shop vac and she came over and helped us clean it up. We spent the next 4 hours frantically cleaning up the flood and doing laundry so we would have clean towels for the birth. I think it actually helped because it took my mind off my irregular contractions and I think also helped jump start my labor. Around 9:00 p.m. my contraction were getting really intense and I had to start really focusing to get through them. I labored leaned over the birth ball while Ricky placed hot towels on my back, which was the only thing that seemed to help the back labor. Ricky kept asking me if he wanted me to call Sherry and April to come but I thought I was going to have a really long labor (like I did with Olivia) and I didn’t want to have them come to early. At 10:30 pm Ricky finally convinced me it was time to call my midwives. Sherry got to my house around 11:00 pm. This whole time I really wanted to get in the birth tub which was now refilled but I was too afraid that it would slow things down. When Sherry got there she offered to check me. I declined because I didn’t want to be discouraged if I wasn’t very far along. Sherry assured me it was ok to get into the tub that I was far enough along that it wouldn’t slow things down. I finally got in the tub and it was such a relief. I labored in there for a while until I had to go to the bathroom. On the way to the bathroom I had 3 contractions and I realized that they were really close together. When I got back in the tub my curiosity got the better of me and I asked Sherry to check me but before she could check me I got the urge to push. She said to start pushing if I felt like it. She checked after my next contraction and said Nayeli’s head was right there. I was in utter shock. I really didn’t believe her because I had been in active labor for such a short time and with Olivia I was in active labor for 14 hours. I pushed for two contractions and Nayeli’s head emerged with her water bag still intact. I reached down and felt her head. I was still pushing but she wasn’t coming out. I asked Sherry if she was stuck but she said no, to just keep pushing. I didn’t know it at the time but her cord was wrapped around her neck, which Sherry reached down and unwrapped. With the next contraction she was born into my hands at 12:15 am, only 3 hours after active labor had started. It was absolutely the most amazing experience. My midwife, April, made it seconds after she was born. 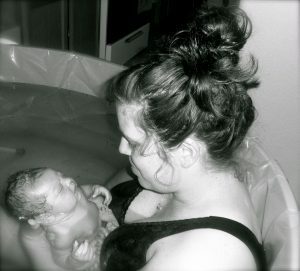 Nayeli and I cuddled in the tub for about 30 minutes until I delivered the placenta. Ricky cut the cord. Then we moved to the bed where Nayeli latched right on and nursed for the next 45 minutes. 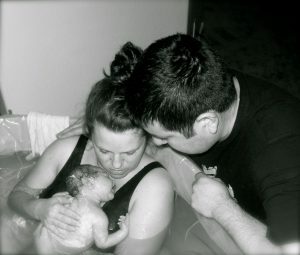 After she finished nursing April weighed her and did the newborn exam. She weighed in at a healthy 8 pounds and 1 ounce. She was 20 inches long. All of us are completely in love with our new addition and in awe of our wonderful experience.